I absolutely love these stones. In fact, they are hands down my favorite to work with. I originally bought them to custom design a birthday bracelet for a special order (aquamarine is March's birthstone) and once I started working with them they quickly became my favorite stone to work with. They give off a soft, cool and clean "vibe" that I find very appealing. 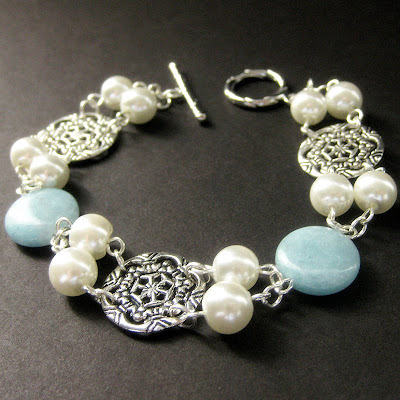 Sleek and cool, this pearl and gemstone bracelet is the perfect accent to any outfit, made with genuine aquamarine gemstone coins combined with soft pearls and intricate silver charms. It's one of my favorite bracelets I've made to date, and I ended up making a second so I could have one for myself! Metaphysically, aquamarine is believed to be a stone of order, courage and clear thinking. It's believed to enhance one's ability for rapid intellectual response (perfect for those who are witty and quick) and encourages the innate ability to always be prepared. Dressy or casual, this piece is sure to make an impression. This aquamarine gemstone bracelet is finished off with a matching toggle clasp that makes this 8.6" (22 cm) bracelet both comfortable and easy to wear. Like all of the handcrafted gemstone bracelets I design, the size can easily be customized at no extra charge.